Commercial fishing for red and blue king crab will be closed again this year for Southeast Alaska. There just isn’t enough crab in the area. Warmer water in Southeast breeds larger king crab than other parts of the state. Southeast red kings can grow up to 24 pounds with a five foot leg span. But unlike places like Bristol Bay, Southeast’s population has not been abundant in recent years. In fact, there have been only two commercial openings in the last ten years, one in 2005 and one in 2011. That last opening saw a price of $10.66 per pound. The harvest that year was worth nearly $1.9 million at the docks. In 2005 it was $5.31 a pound. Fishermen would like to be able to keep earning that kind of money in the fishery and maybe in the future they can. Even though the population is nowhere near the right size for a commercial fishery, there’s reason to believe that the crabs are seeing slow, consistent growth. Adam Messmer is the Assistant Shellfish Manager for the Alaska Department of Fish and Game. He says the mature biomass increased from last season, meaning more crabs are approaching the size to be caught commercially. There are also more crabs that are already large enough to be caught. Mature biomass and legal crab–those are industry terms regarding the age of the crab. 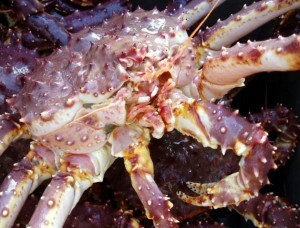 Age is important in the fishery because king crabs actually live a pretty long time, like up to 30 years. And there are regulations in place to make sure the crabs are old enough to reproduce before they can get caught in the Southeast fishery. Messmer says they don’t reach legal size until they are 7 to 9 years old. What biologists would really like to see in the Southeast fishery is what is called “a recruitment pulse”. That would be a year when a large number of crabs the same age are reaching legal size. Messmer says that would help sustain the fishery for a few years even if there weren’t good pulses. While the pulses are common in other crab fisheries they haven’t seen one in Southeast’s red and blue king crab fishery for the last 15 to 20 years. “By not having one for an extended amount of time we kind of reach our threshold and fish on them and we’re kind of in this scenario of there are still crab out there because we don’t take them all but it takes a longer time to build back up enough to hit the threshold,” Messmer said. Back in the 1990s and early 2000s there were commercial openings for red and blue King crab nearly every year in Southeast. And that’s something that the managers are working towards again. The state has been keeping consistent records for Southeast king crab for over 30 years. They’ve used survey results from their staff and from commercial fishermen themselves to document the population.